It Stays will hold up almost much anything that may slip on your skin. Support and surgical stockings. Surgical and orthopedic belts and devices. Men's and women's socks - knee socks, nylons, pantyhose, shoulder straps. Wigs and toupees. 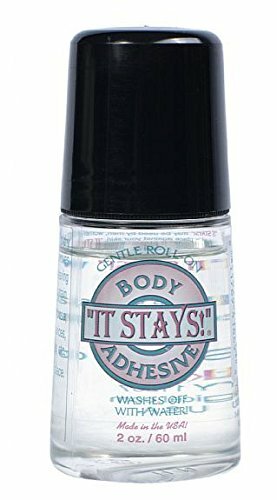 it stays roll-on body adhesive - Theatrical make up and devices or anything else you want to stay put! It Stays! is so flexible, you will never know it's there .Roll-on applicator applies with ease, gives complete comfort and flexibility of movement. Simply apply small amount to skin to hold article in place, for example at the top band of the stocking. Not irritating to skin. Our private line of high quality IT STAYS at value pricing! All products are designed and engineered with your comfort in mind. Absolute Support delivers physician-prescribed elastic compression therapy guaranteed. Just like the big name "brands"
Jon Renau Thermal Spray 8.5 FL. OZ.